It’s official: any new homes built in California after 2020 will have to be at least partially solar powered. The California Building Standards Commission voted unanimously to approve new standards that require new homes to offset their electricity needs, the Orange County Register reports. Other requirements part of the new “green” building codes include thicker insulation, more efficient doors, and improved ventilation systems. The new solar power requirement applies to any new buildings that are up to three stories high — including apartments. Homeowners will also have the option to generate or buy electricity for a local community- or utility-owned electricity grid. Critics of the new requirements argued that solar panels and the installation is very expensive, and that not all locations in California are conducive to generating solar power in a cost effective way. The Building Standards Commission is planning to respond to those concerns by allowing homeowners to lease solar panels from the government or signing “power purchase agreements” that could essentially allow them to buy solar energy from other producers, according the Orange County Register. 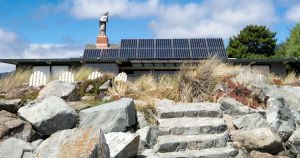 There are some caveats: home owners won’t be required to offset their entire electricity bill with generated solar power. The new requirements also come as much of the state is still reeling from the shock of some of the biggest wildfires ever recorded. While offsetting reliance on fossil fuels is a good thing, the new provisions could make it even more difficult for Californians to rebuild what they have lost in the wildfires this year. But given enough time, economies of scale could bring down the costs associated with generating power at home — and that’s not to mention the significant long-term savings of relying less on expensive fossil fuel power. The post California Now Requires Solar Panels on All New Homes appeared first on Futurism.